If you're in the Philadelphia / South Jersey region and want to run a node, please leave a note here. Also helpful if you can introduce this idea to a local club. I'm working on a node or three right now. I'm located in Upper Providence, Delaware County, PA (FM29hw). If anyone is interested in testing things please reach out to kb3eaw@arrl.net. 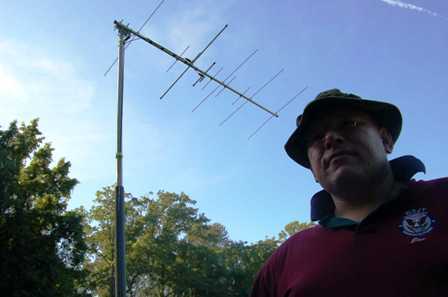 W3JY-MESH-03 active in Malvern, Chester Co Pa.
Hi All! I am very intrested in setting up a number of nodes in the Montgomery County / Bucks area and have a number of sites to setup maybe 4 nodes. I am also part of Montgomery County Races, and with PEMA (Pennsylvania Emergency Management Agency) out of the Eastern District Office that serves 20 county's including Philadlephia, Delaware Co, etc. I am looking to establish nodes at these locations and hopping that I will be able to get them setup and working. Also, each of the locations has dedicated internet that we can plug into the nodes so that the Mesh will have access. Trying to get a node up on the Delaware County Fair Acres building in Lima, Pa. 19 stories +/- and backup power courtesy of the county ARES. Even with a Linksys it ought to cover several miles. No ETA but general permission has been granted in conjunction with other projects at that location. Maybe before the end of the year. Hello all. New to HSMM-mesh. Located in New Castle, DE (FM29ep) near Christiana, but mainly interested in utilizing HSMM-mesh in the field. I currently have a solar-powered APRS weather station in Swedesboro, NJ http://goo.gl/maps/8rwbK and thinking of attempting a HSMM-mesh node for still imaging from this location. I am about to deploy another solar-powered APRS WX station in Bear, Delaware. I currently have a Linksys WRT54GS V2.1 running HSMM-mesh, but no external antennas. Need to determine my application before deciding on an antenna design. Feel free to PM or email me mycall @ arrl dot net if you like to discuss any ideas. Can we take a role call of HSMM nodes in the Phila region? Are any of these are up and running? Anyone who might be accessible to a node in Camden county, NJ? Thanks. I'm located in the Pottstown area (about 40 miles Northwest of Philly). And while I probably can't contribute directly to the Philadelphia effort, I wanted to make myself known and just say I'm following this development with great interest. Hi, my name is Ed, and I'm a newbie to mesh networks. I have a WRT54GL, and am in the process of putting up an antenna. Almost there, but not quite. I'm located near Norristown in East Norriton (fn20hd). Interested in seeing who else in the area is active here. Hello All, In Sharon Hill, Delaware County FM29iv, and have a Node ready but cannot see any others and not sure if I should put it on roof or keep it as portable. Its a WRT54GL with one 15dB Omni directional and 1 24dB parabolic. I have tested for a couple weeks now but am just not able to see another one, I did connect successfully with a spare I have, so I know its all working. I Hope to see more soon. As of today 8-19-2014 I have a working node in my vehicle! This node will be used in conjuction with a router and air card giving internet access to the connected routers. If the air card or cell system is down, the node will utilize its ability to connect to other nodes that may have internet. My vehicle generally travels mainly in the Montgomery, Bucks, Chester, Philadelphia counties and hoping that it will connect up with some of the local nodes in Delaware, Chester, and Philadelphia areas. Router is setup as AA3JC-MOBILE001 In the next few weeks I hope to have a working node at my home setup with both a omni 23dbi gain antenna for local area reception, and a 25dbi gain yagi pointing towards Delaware/Chester nodes that are currently operational. I will post here again when I am ready to test connecting up with those nodes! I currently have everything ready to put together but waiting on the 5w Amp for the yagi. I did find a weather proof enclosure that is large enough to hold the router, amp, and power supply. Will post here again when installation happens! Hey, AA3JC, you ready to test that yet? I'm new to mesh, but am relatively close to you. I finally got some equipment to test with, a couple of WRT54GL units. I just have the stock antennas at the moment, but will tinker with that in the near future. Ok...So I now have two routers set to go, an Ubiquiti with a 24 db dish, and another with an Omni antenna. Going to be installing the antennas next week, and looking for other nodes in the area. I'm in fn20hd near Norrristown. I am east of Philadelphia on the very nothern edge of FM29mx. Is this community still active ? I am east of Philadelphia on the very northern edge of FM29mx. Is this community still active ?